I learned quickly in my first year of college that my high school study habits weren’t going to cut it in college. Like maybe some of you, I didn’t have to study much in high school. I’d listen and take notes in class and then go home and maybe review them once. And that worked for me! In college? Not so much! On college exams, a lot of professors ask questions where it seems like the only way to answer it is by reading their mind. Gone were the days of simple definition questions. But, once I became more familiar with the types of questions professors would be asking, I was better able to study. My trick? Cornell notes! Now, if you went to a high school like mine, Cornell notes were forced upon you and you most likely hated them. But coming to college, they have been my saving grace. And it goes back to my point about reading the professor’s mind. While studying, it’s important to not just read the material but to also question the material, which is exactly what your professor is doing when crafting exam questions. 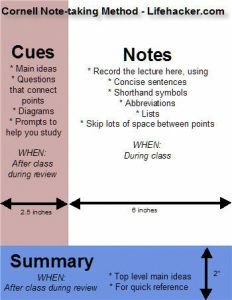 Cornell notes set you up to do this by they way they are formatted. On the left hand side of your notes you ask questions and state terms, then on the right side you answer the questions and define the terms. When it comes to study, simply fold the paper to separate the questions from your answers and you’ve built yourself a practice exam.